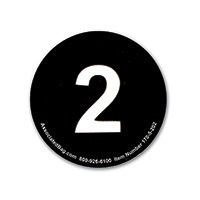 2" Round Black Number Inventory Label - "2"
Item Number: 170-5-202 18742 Actual Weight: 0.5 lb. Peel-and-stick number inventory labels can be used to organize cartons and shipments. Choose from numbers 0 through 10.